Get affordable Security Camera installation on Pico Rivera, CA and CCTV equipment with commercial quality and 2 years warranty. We have been working on Pico Rivera since 2005; we provide high quality security camera installations. The equipment that we install has commercial grade quality, and we offer the best price in the market. If you want a security camera system, the key is not buying most bigger and expensive system that you can find. If you invest a lot of money there is no warranty that you’ll get the best. You’ll have to make a little research on the product or the provider of the system to make sure that you’ll get the security camera system that you need. If you want to do some research about surveillance camera systems, you have to start by identifying the needs that a camera has to meet, to fulfill your requirements. For example if you want outdoor cameras, you’ll have to be sure that the security camera is weather proof, or water proof. If you have no light around your property, have a powerful night vision camera will be a good idea. With knowledge about your requirements, and security camera systems you will be prepared to interpret, and accept a proposal from a CCTV company according to your budget. Protection4less will provide you with a detailed proposal were you will get specifications of the products, camera map, and pricing. There is no hidden cost in our proposal. 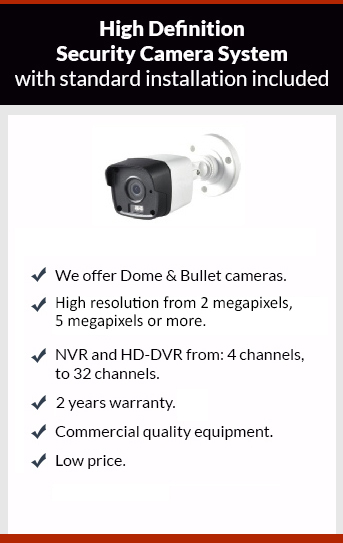 There are no monthly fees for our service; you only pay for the security camera equipment and the installation. We offer 2 years warranty for equipment and installation. If something fail in your system you are protected for our warranty, and you don’t have to pay for trip or labor; we just replace the part or fix the system, no cost to you.